Shakes. Fear. Real fear. Shallow breathing, eyes darting around. Nervous energy. Scanning, scanning, scanning for the threat. What’s that? It’s nothing. Is that a…? No, it’s nothing. Breathe. Noise?! What’s that sound? It’s nothing. You are going to die, you are going to DIE. No, not right now, I’m ok. Robot. No, I am real. I feel fear and I am real and I am safe. Everyone is looking at you, they know. Are they though? Oh crap, I’m so scared… And this is a snapshot; a tiny moment when my PTSD/anxiety kicks off. I use strategies like breath counting, noticing details of where I am, mindfulness, comforting smells and tastes. I don’t know why this has started getting worse again. I can observe it happening to myself, I can understand that it’s not real but I can’t stop it. I’ve noticed that I’m trying to avoid going out again. An episode like the above will last for hours. With a heavy heart I can take my emergency lorazepam but it feels like a failure; I thought I was past this…but I’m not. Frustration. Just stop it. Just stop feeling like this! 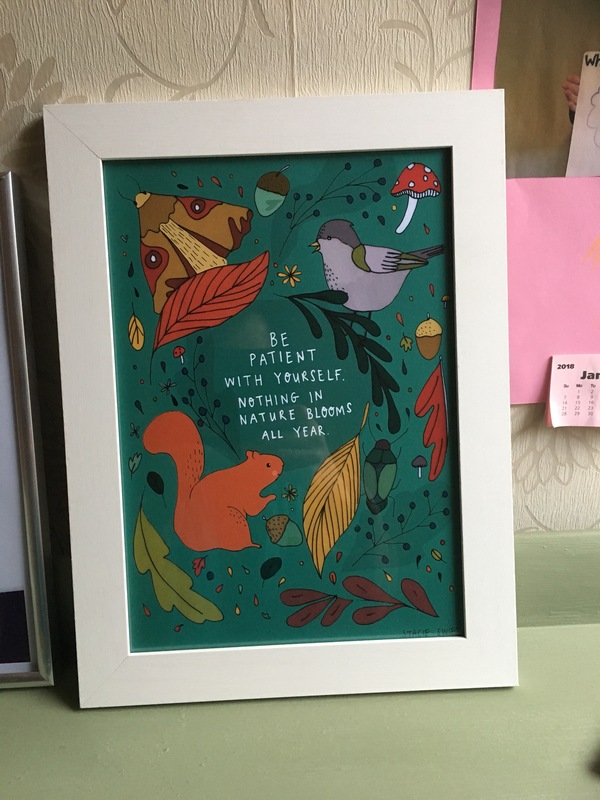 I’ve learned that beating myself up about it doesn’t help, it only feeds the depression so, instead, I have to accept that this ‘thing’ happens inside my body and try to kindly and patiently work with it, work through it. Anyway I realised that I could run on a treadmill. Treadmill running feels safe. I am entirely aware of my environment – no surprises. It means running whilst staying in the same place, observing. I can listen to my music, in a world of just me, safe. Safe. So that’s what I did. Shaking, and feeling like I wanted to throw up I went to the gym and got on the treadmill. Even changing into my running stuff helped. I was putting my armour on. I was fighting. Fighting this thing inside of me. Adrenaline? Yes, please. I can run with that. Literally. I chose to use a guided run on the Nike Run Club app. 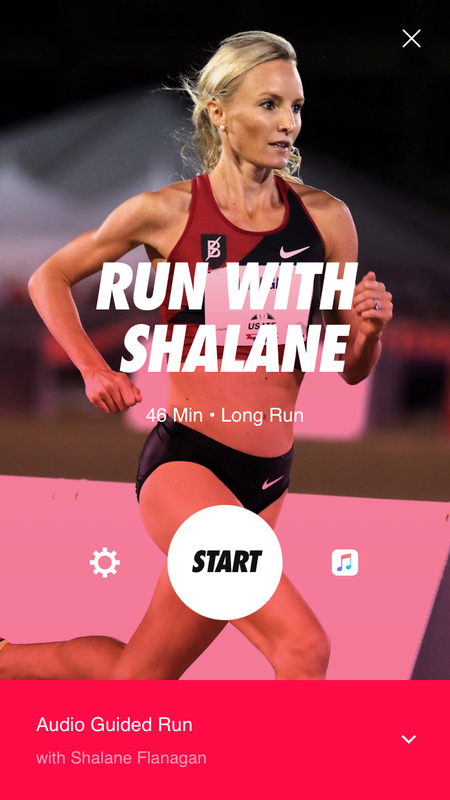 I selected a long run with Shalane Flanagan. If you don’t know who that is then she’s the female winner of the New York Marathon 2017 and, let me tell you this, she is an incredibly inspiring woman. She is a lady with a tale to tell. She talked me through a 46 minute run. She talked about enjoying running, about motivation, about success, about failure, about determination, about teamwork. It was just what I needed. A tonic for the soul. Honestly I was almost thankful that my fear had pushed me to do this. I smiled as I ran, the comforting thud whirr this whirr sound of treadmill running. I was listening to encouraging songs, their words further pushing me along. When the run was finished I had to move quickly. It was kid pick up time and it was late. I felt a pang of guilt – I would have liked to pick them up earlier, but then, I thought ‘you know what? I reckon this Mum picking them up is a lot better than the dissociated afraid woman that I was before the run.’ I sat in the car and actually congratulated myself! Congratulated! Imagine that?! Kate, you are awesome. You did this. You did it. You didn’t let fear win. So I was smiling (and very sweaty) when I picked the kids up. Good thing too as they were both on full whinge mode. Promises of a chippy tea seemed to ease their complaints. Which was good because I did have the thought – some times there aren’t enough endorphins in the world to deal with moany kids are there? Flippin’ eck! 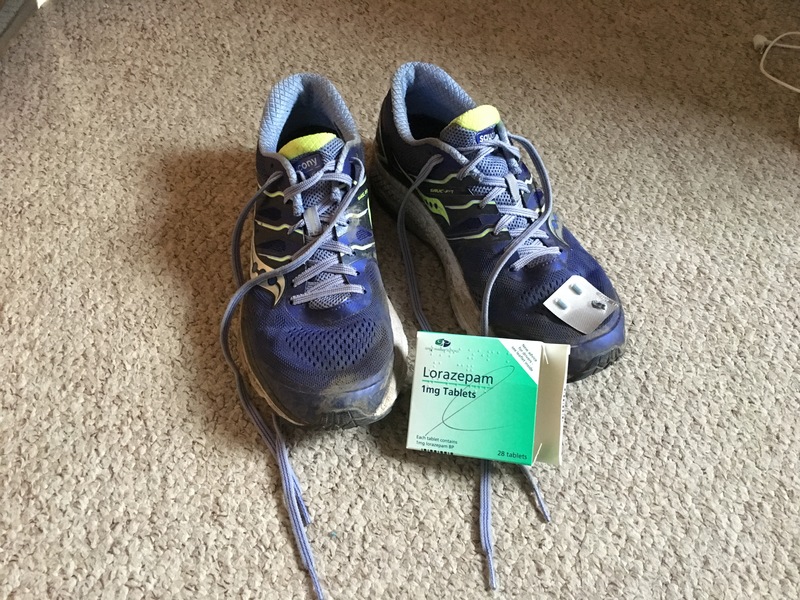 Tablets and trainers, both have their place. Will the fear come back again today? I don’t know but I will not fear the fear. I shall prepare in case it does and I will remember that feeling from yesterday: Kate, you did it. You are awesome. And I will keep doing it because I love my children and my husband and, sometimes…just sometimes…I think…maybe…just maybe…I’m ok too. (Maybe).